We’ve heard the statistics. We’ve seen the evidence. We know there's disparity for girls and women pursuing academic attainment and careers in STEM fields. One solution that's tossed into the mix for fixing the issue is advocating for all-girls schools, programs, and organizations. There’s little consensus among the research to indicate why a gender-divided approach works. So, in late spring, we did our own informal, brief investigation at the FIRST® Tech Challenge Robotics Championships in Houston, TX. A quick glance of the rosters at the championship and you’ll see a good number of all-girls teams participating. To name a few: Ponytail Posse, Rock N’ Roll Robots, RoboChicks, Diva Force, Iron Maidens, and more. We chatted with a few about what having an all-girls team means, how it can help, and why it was important to them. One big takeaway is that boys often take over the technical roles in coed teams. After that initial experience in FIRST LEGO® League, the girls decided to create their own FLL team and then FTC team. Though all the team members attend school together at the Don Tyson School of Innovation, the team is not a school activity so they meet on their own time. 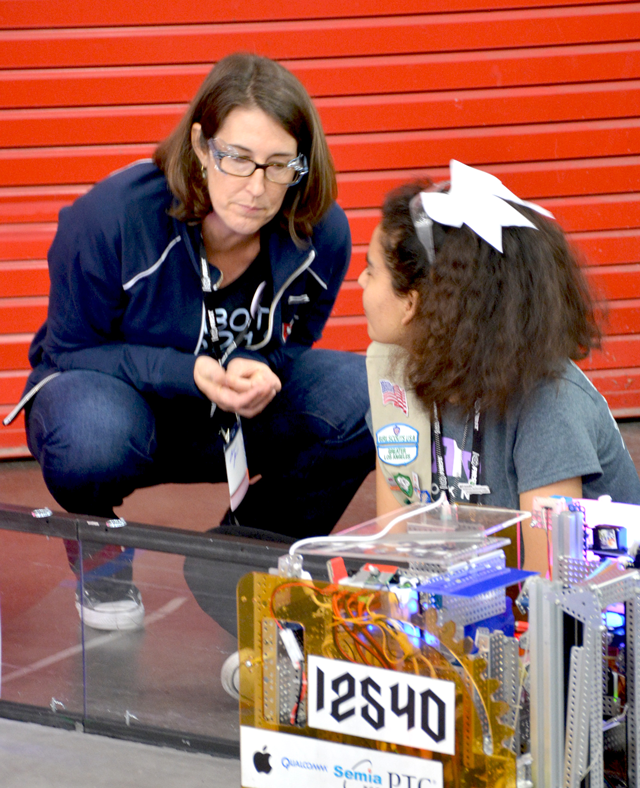 Julie Townsend, a technical mentor for FTC Team 25 Rock N’ Roll Robots that was founded by Girl Scouts in the Greater Los Angeles area, said that girls are more hesitant than boys to step up and usually end up in less technical roles such as communications or marketing. “Girls will take themselves out of it before they even start and never find out how good they can do,” Julie said. 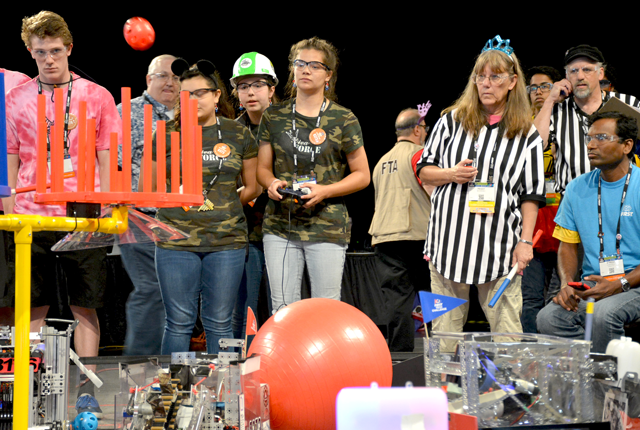 “Typically, what we have seen is that girls in a mixed environment or a majority male environment have trouble bringing their ideas to the forefront and really pushing for what they believe is right in a technical sense,” added Taylor Halsey, former Rock N’ Roll Robots member, current master’s student at California State Polytechnic University at Pomona, and a team mentor. 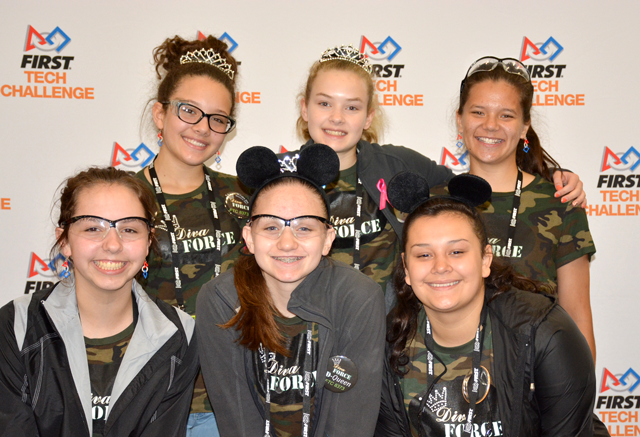 According to the mentors, an all-girls team ensures that young women have the chance to step up into more technical and leadership roles, including designing, building, and programming. Julie also has noticed that girls’ teams do above average in FIRST competitions. “When you look at the higher levels in the competition, you will see that relative to the number of girls’ teams that participate in the competition, the number of girls’ teams that end up being considered for those high awards is disproportionately high. Girls, once they are fully invested in the program, implicitly understand all the different aspects of FIRST and how they work together to make a whole good program. That shows in how well they are received by judges and how well their robots come together. Additionally, these teams say their experience is a bit different than many other teams. 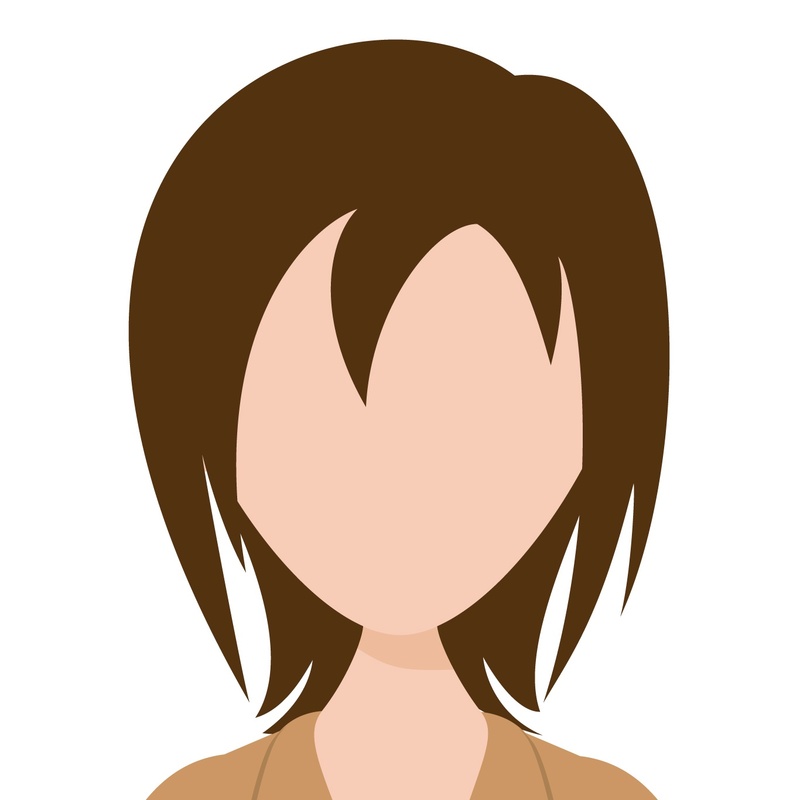 For those considering mentoring such a team, Julie said it shouldn’t present additional technical challenges. Today’s youth – boys or girls – don’t have much exposure to tools. “You’re going to be starting with kids who’ve never seen a tool; you’re going to be starting with kids who’ve never programmed,” she said. 3. Connect with other mentors. You won’t be alone – in fact, there’s even some online communities to support girls in FIRST: FIRSTLikeAGirl (also @firstlikeagirl on Twitter) and FIRST Ladies. So take heart and don’t hesitate to build your own team!